Candlewood Suites Park Ten is conveniently located off I-10 west, exit #747A, Fry Road. Our convenient Katy hotel location allows you to take a trip to Houston or enjoy any of the various area attractions, which include George Bush Park, Top Golf, Katy Mills Mall, Typhoon Texas, Frozen Ropes, The Equestrian Center & The Merrell Center. Other popular Houston, Texas attractions include The Toyota Center, Downtown Aquarium, Houston Zoo, City Centre, Discovery Green, & The Galleria Mall all less than 25 miles from our Katy hotel. 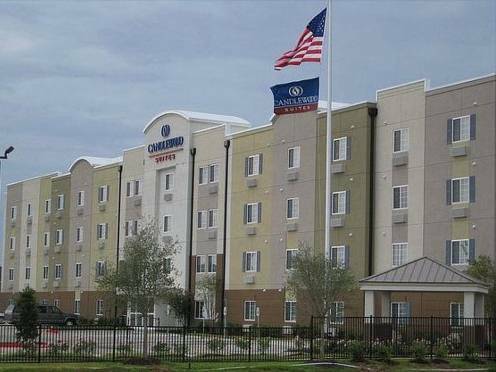 Business travelers will enjoy staying at Candlewood Suites Hotel in Katy, because of its close proximity to the Energy Corridor and area businesses like, Mustang Engineering, Exxon Mobil, Conoco Phillips, Park 10 Business Park, BP Exploration & Shell Oil, all within 5 miles of our hotel. Additionally, we offer a business center & an on-site meeting room. We hope you enjoy our cozy & exceptionally clean accommodations at our Katy, Texas extended stay hotel. Our popular amenities include a 24-hour convenience store, fully equipped kitchens with 2-burner stoves, 150 cable channels with Direct TV, free parking, a 24-hour fitness center & complimentary laundry facilities. We are also located within walking distance of several grocery stores and shopping centers, as well as a Starbucks around the corner! We look forward to welcoming you to your home away from home" book online with us today! Our meeting room can be set up to your specifications and accommodates 25-30 people depending on the seating arrangement. We offer complimentary coffee and allow guests to bring in their own caterers. The best thing about Bear Creek is that it opened as a result ushered in a new era of golf in Houston. It was the 1st daily fee course in the area that was not run by a municipality. Since the original course opened 25 yr ago, 2 more have been added.